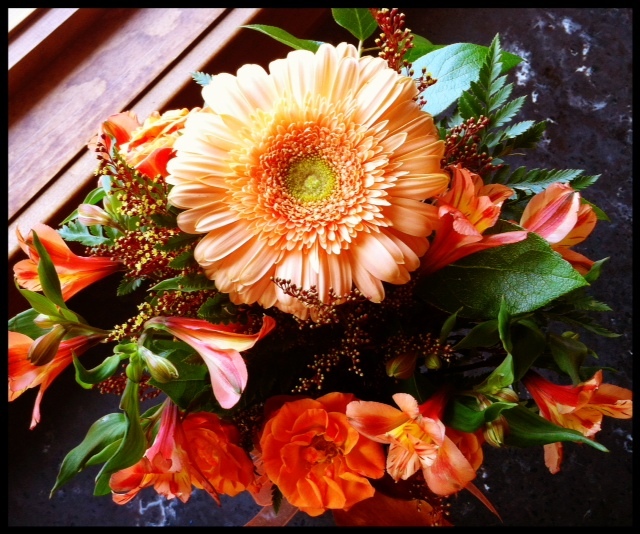 Lovely flowers from an encouraging friend to help brighten my weekend. Praise God for my sisters in Christ! I won’t assume you were sitting on the edge of your seat, but if you were… please forgive me. left a lot to be desired. I’ve had my own personal-upset going on and frustration continued. Tuesday I visited with the eye specialist, who seemed to think my uveitis might be slceritis instead. Not that huge of a difference, other than what we’re looking for with auto immune disease. He was VERY nice, but highly distracted, and didn’t listen to me much until almost the end of the 2 hour appointment. After the entering of records that took forever, and a 10 page questionaire I had to complete… like he was literally INSIDE my eye-ball with as many devices he could test me with. No, seriously. It felt like it. Short of REMOVING the eyeball itself, I felt we had a very in-depth investigation… with light brighter than the sun that was blinding, if was indeed – not already, blind. I still had hope that Dr. E would be calling with more information, so I wouldn’t have to wait another month with no direction. On the way home from my appointment, I tried to discern the differences between the two eye inflammations. I was certain it was uveitis I had… but Thursday I would talk to my local eye Dr, and I knew he would have some insight into what HE actually saw going on… to be able to report to the specialist. Wednesday I finally received a call from Dr. E’s office. It wasn’t the call I was hoping for. While I tried to make sense of things with her nurse, my heart was ripping into two. I’m not even sure the rest of the conversation… other than she was going to have the Dr. call me, and review with her what I had done so far… and never gave me a time frame. When I hung up the phone my head fell into my hands and I wailed… until my chest hurt and I couldn’t cry any more. I couldn’t even believe this. I had been so exhausted every morning this week – most days were becoming a challenge to even get through daylight hours, and now this? He led me to email Dr. E. I prayed over the words I sent – not with anger, but with purpose. I needed help. I wanted HER help – and I couldn’t wait until mid-December. It was a long day of feeling sorry for myself. I knew that untreated celiac leads to a host of auto immune issues, but chronic inflammation due to your body attacking itself leads to cancer…. I prayed for peace, and rest – and energy to get my work for the week completed. I had my closest friends praying, for a miracle… and I felt like one came that night. Dr. E wrote me back. She explained she was having her nurse call and would be calling me Monday to discuss things. She was kind and caring… and everything I loved about her… and I was *so* grateful. In the mean time I’ve gone back to searching the chance of it not being sarcoidosis, further tests, other symptoms I’ve had, etc – trying to remember it is probably several auto immune diseases over lapping – and that is why this is not some “24 piece puzzle”… but rather a 5,000 piece design of the ocean with a missing piece that will never be found. So there you have it. My weekly update on lack of answers … and a continued worsening feeling. God has filled me up – and kept me going … on His strength… I suppose that’s how He designed me to survive this challenge. As a rule, I haven’t been overly sad about things, nor depressed – but I have felt very defensive when people want to know what I’m not better, and I don’t have an answer. Not because I want to know for them, but for our family. I know that celiac is probably the tip of the iceberg, and undetected celiac leads to many other auto immune diseases – so we could be searching for multiple issues… and I’m honestly FINE with that. I just want to know. You know? As I study other auto immune diseases, and symptoms – it helps me to narrow our search. Many different things you have can cue a specialist in, on what you could have. The eye Dr. took specific interest that I had chronic pink eye, sinusitis, dry mouth, yeast infections in college and lymph node issues for years… Feet falling asleep, hands/feet that fall asleep often, muscle spasms, varicose veins, DVT (deep vein thrombosis), and low BP are other cues… that can help them know what to test. As the eye Dr said – celiac is probably the cause of all of this. While we know gluten can worsen many auto immune diseases, celiac is known for being one of MANY auto immune diseases that you have issues with. But I truly am thankful to have people who do want to help!! It’s truly something you can’t explain – it’s awful. Insanely awful – and SO frustrating. No amount of sleep fixes it, no naps, no resting… nothing. It can hit out of no where… most often when you’re REALLY needing energy. I’ll tell you what. This teaches me a lot of empathy… for those suffering from diseases which they also have no control over, that we can’t see…. they’re not trying to complain when their bodies hurt, they don’t mean to be anti-social when they can’t eat your food. They’re not faking it on some days… They’re truly ill. Be an encourager and pray for them, it will do wonders for their spirit. Posted on November 11, 2012, in Celiac/Gluten Sensitivity, Change, Diet, Metabolism, Our Struggles and tagged auto immune disease, auto immune disease testing, celiac, healthy for him, scleritis, uveitis. Bookmark the permalink. Leave a comment.